This has been another week of tidying up loose ends and finishing off miscellaneous tasks. 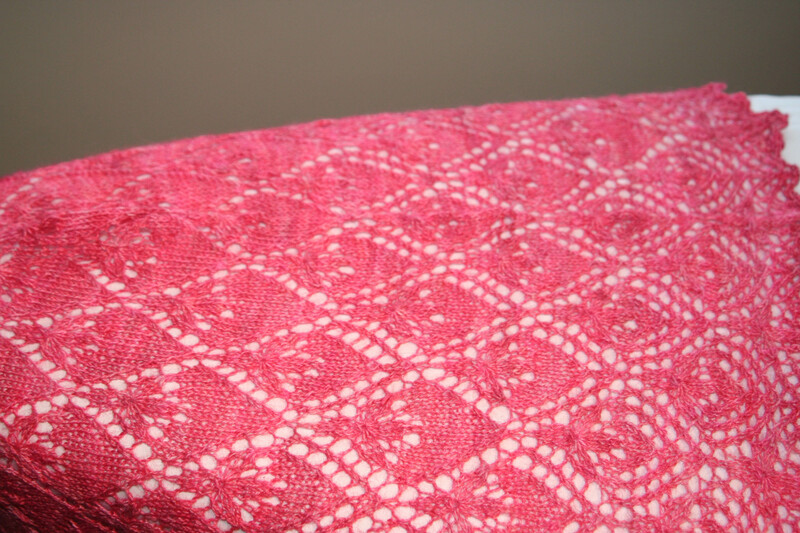 Remember the luscious Coolree alpaca-silk-cashmere lace I turned into the Strawberry Beds shawlette (called after an area on the left bank of the River Liffey)? Well, I had to block it while folded, because of the built-in Faroese shoulder shaping (see above, moulded around the end of the ironing board). 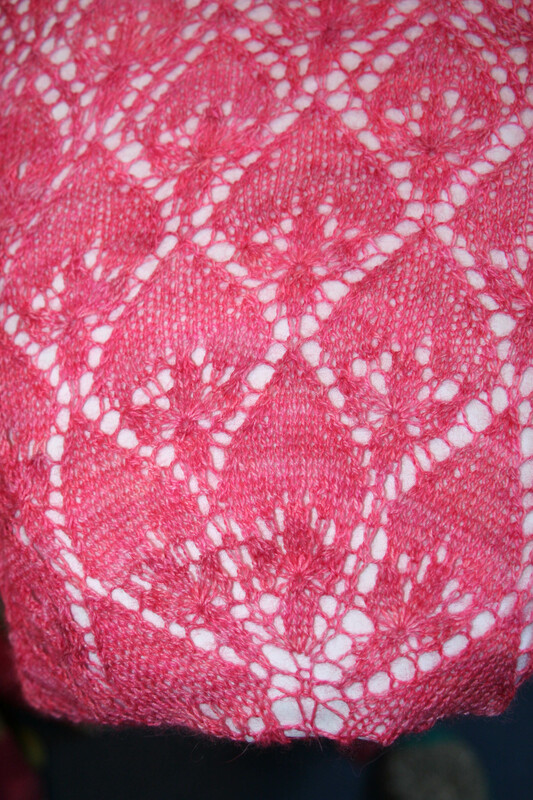 This left a bumpy crease down either side- not a good look- so I had to bend my cardinal rule of never letting an iron anywhere near one of my knitting projects. See that line of puckers? Sorry about the photo, it was much worse than it looks here, honest! so I dug out the ironing board, dusted off the iron- that’s right, I don’t iron, life’s too short- and I soaked a little towel to protect my delicate creation from the worst of the dragon’s steamy breath. Seriously, it’s so easy to spoil textures, never mind ruin weeks worth of work with an iron- I am definitely not a gambler. As you can see, simply holding a warm iron in the general vicinity of the fabric did the trick nicely, and my nerves have almost completely settled down again, thank you very much, though I still haven’t managed to capture all the glorious shades of colour in this yarn…. ..and the strawberries are standing on their heads. But they’re the right way round when worn, so that’s all right. By the way, if any of you are going to the Knitting & Stitching Show in London next month (14-17th March), keep your eyes peeled for the Coolree stand- Alex will be there with a selection of his latest goodies. 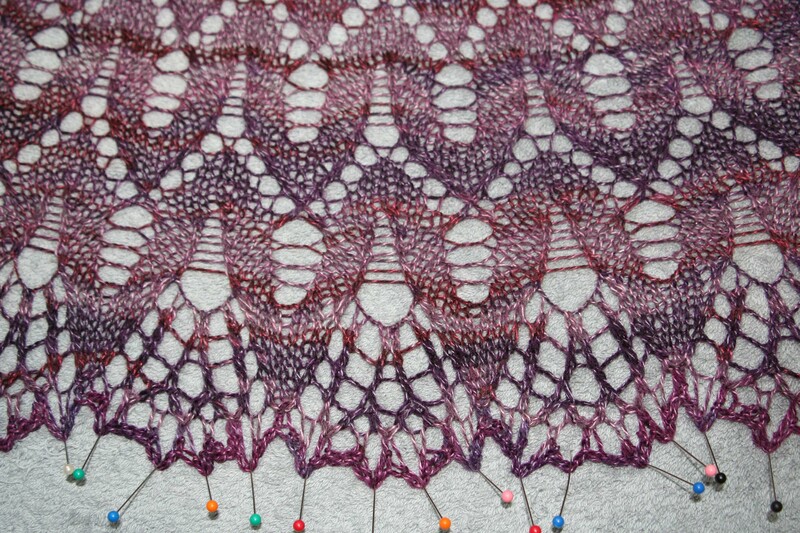 I finally blocked The Orchid Thief (Isolda Teague), which I knit up using a (100g) ball of Jawoll Magic sockyarn (Lang). This is very soft to the touch, and the colour transitions are long and subtle, which I like, but I don’t think this yarn would wear well as a sock, despite its 25% synthetics. I had to rip some of it, and afterwards it looked the worse for wear, which shouldn’t happen, if this was actually meant for socks. 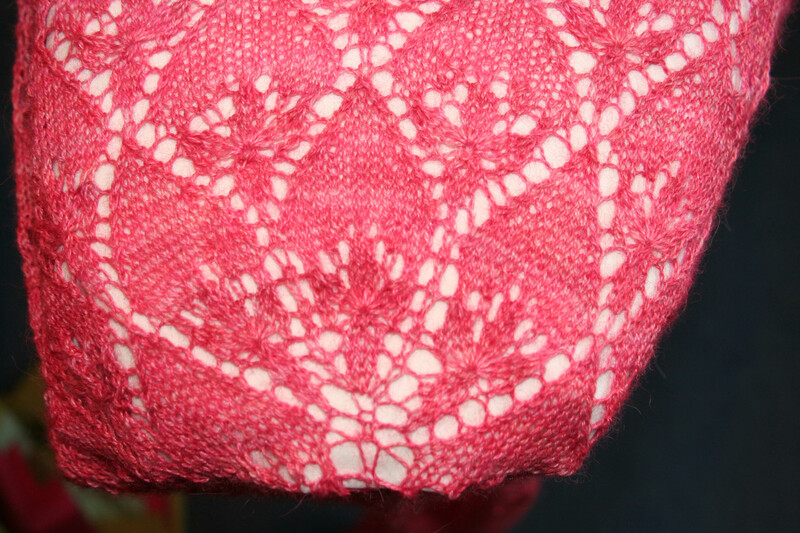 I think it was designed for lace that would be treated very gently, and was only called sockyarn because of its weight. 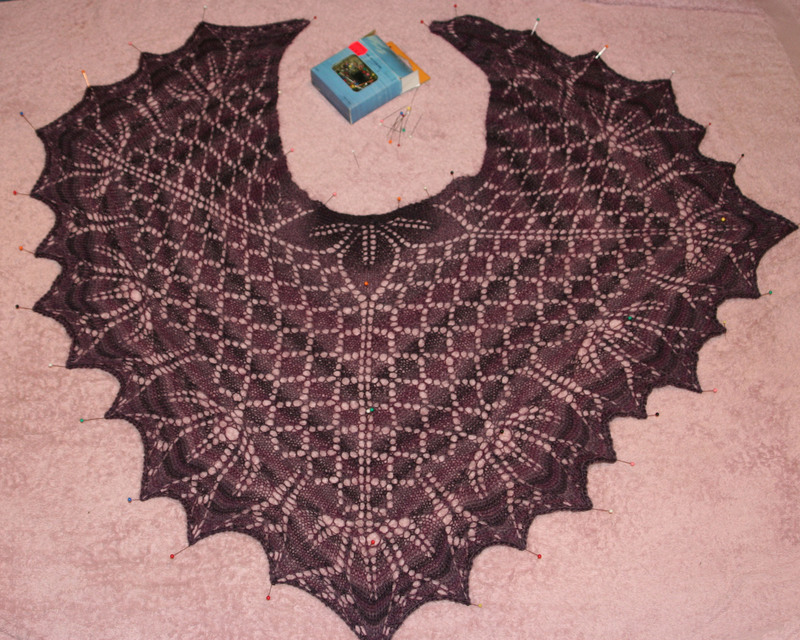 If you’re thinking that it looks crooked, that’s because it is- I was away with the fairies while I was knitting the body of this (diamonds are boooooring), so the fronts ended up different shapes and I can’t have you thinking Ms Teague is the root of the problem. If it was my own design, mind, I wouldn’t let on (design feature, challenging orthodoxy, blah, thinking outside the box, blah, you know the guff..). I obviously wasn’t at my best while blocking either, was I? 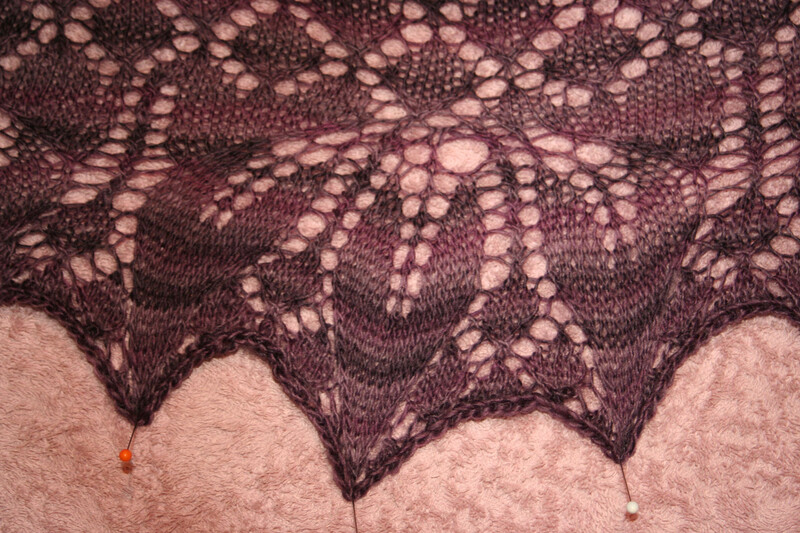 Alright, I’ll admit it, I’ve had other things on my mind- my DS is not at all well, and there’s no end in sight, so while knitting is a very therapeutic help at the moment, the finished product is definitely showing signs of fluctuating concentration. Part of the time I’m fixing stuff: a quick boost to morale is guaranteed! 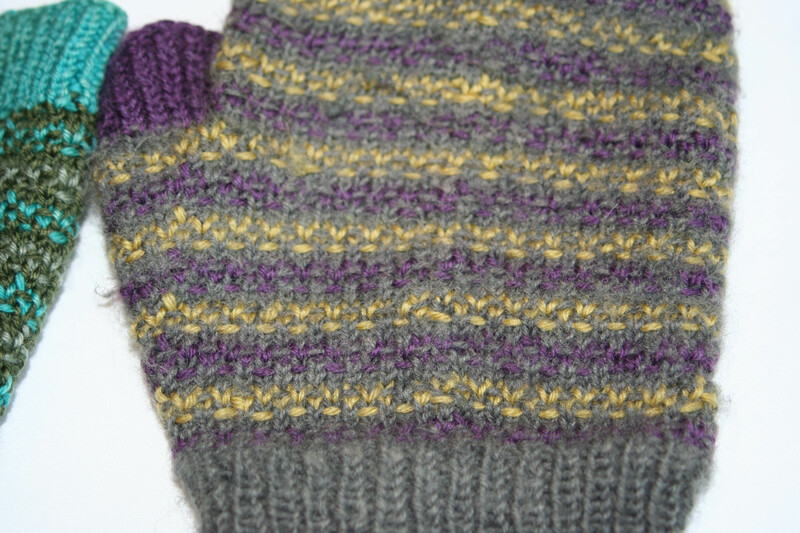 While knitting the grey appeared just the same as the Yeoman yarn, but after a little bit of friction it fuzzed and pilled as if it were felting wool- I was disgusted! 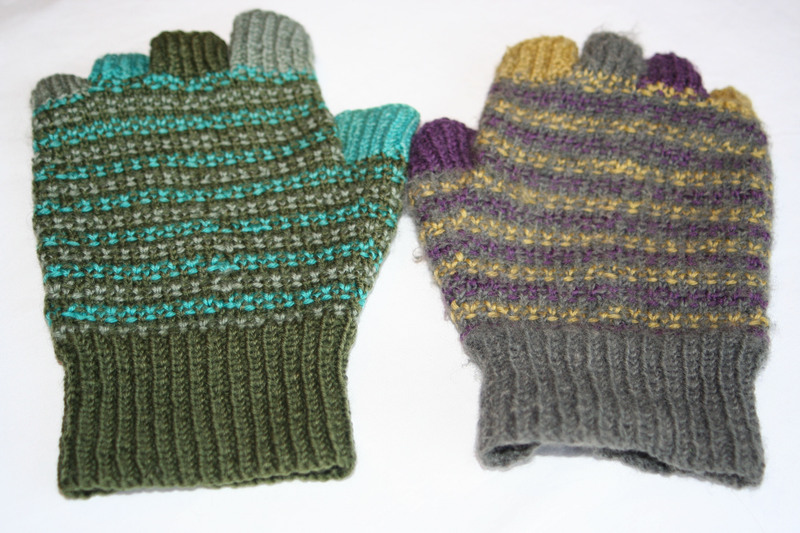 You can tell the glove on the left has been using the expensive revitalising serum, can’t you? In order to cheer myself up, I’ve been re-reading the Harry Potter books, and of course new designs have been popping into my head. 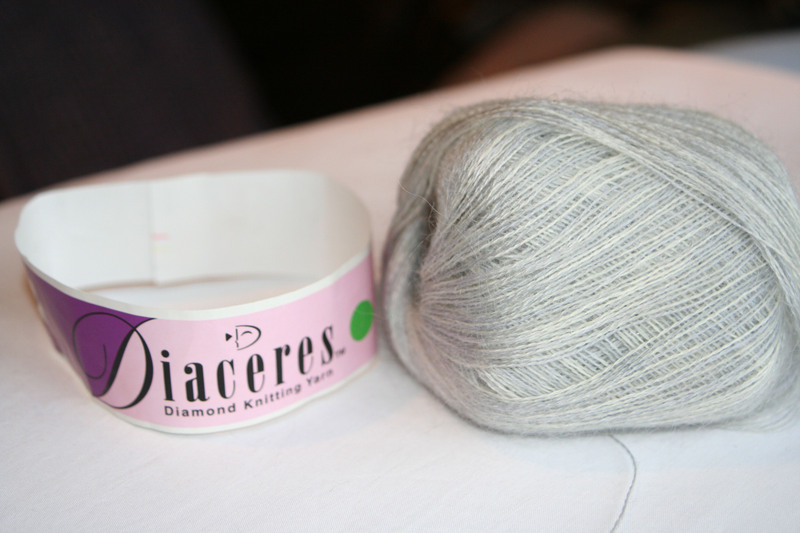 I decided to start a nice’n’easy project, using 75g of pure mohair from Japan – part of my yarn-diet stash from the sale in aid of the Dublin Society for prevention of cruelty to animals. You can tell that pure mohair yarn is made from goats: it’s got a mind of its own and is willfully contrary. See how smooth, sleek and well-behaved it sits there in its ball? 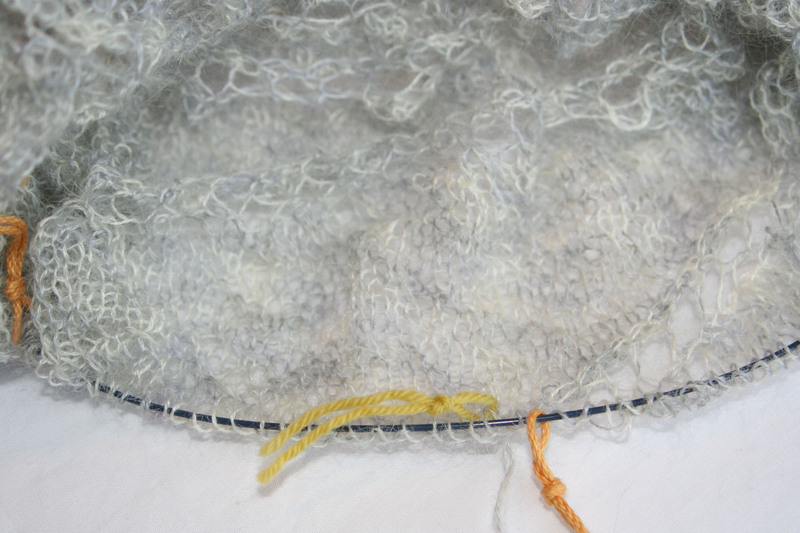 Well, no sooner is it on the needles than it starts to fight back, doing its best to unravel itself and kinking at every opportunity. 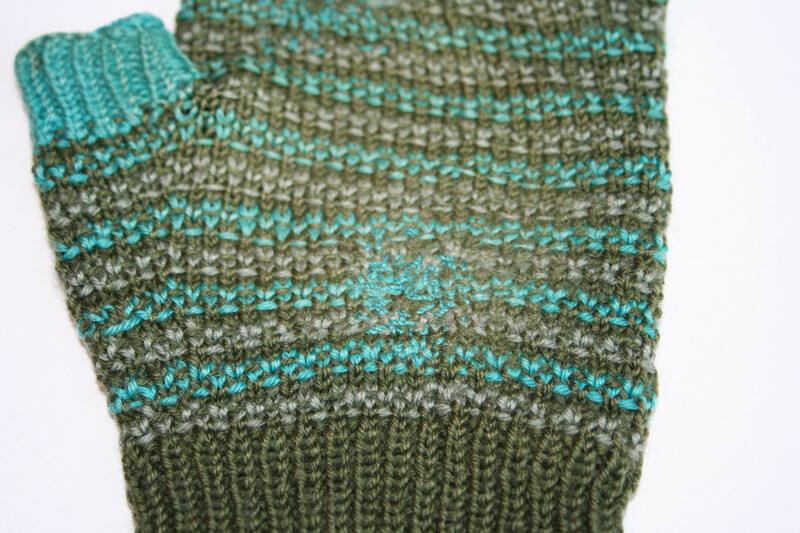 My stocking stitch generally looks fairly neat, not in need of much blocking, but this may be the one project I’ll happily take an iron to- I haven’t produced such irregular-looking stitches since I was five! 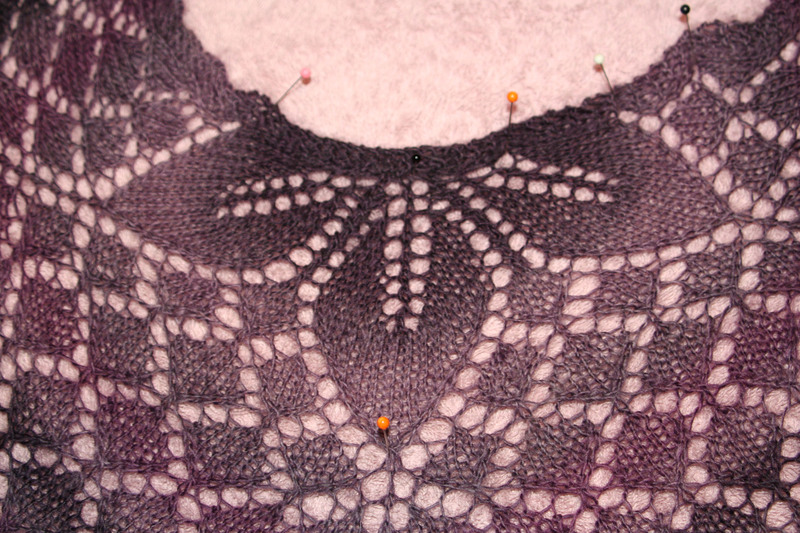 And this tangled web is supposed to turn into a Pensieve shawl- uh oh! 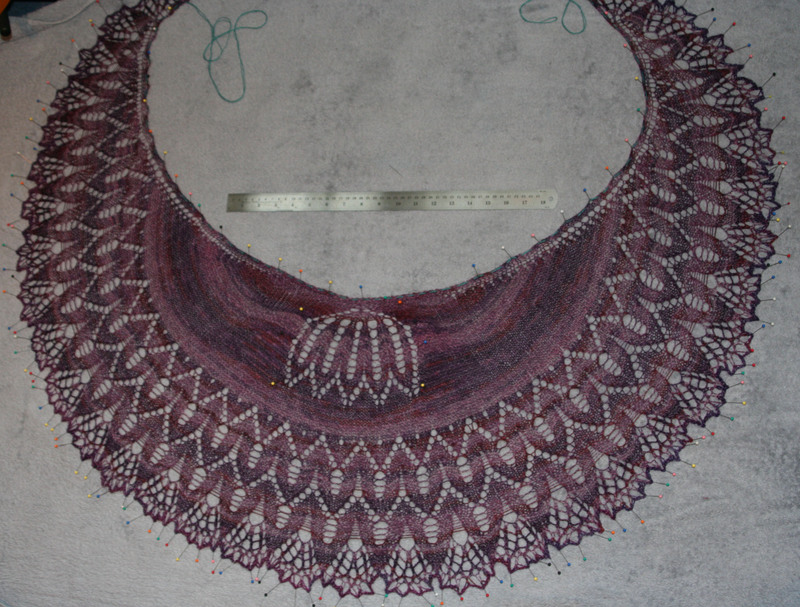 Mind you, one project did eventually go right this week, though I had to rip back a good 50% first. This is called Martina, after the dear German girl in my knitting group, who not only recommended this excellent sockyarn ( Aktiv silk, from supergarne.com) but also carried bushels of it back from Germany for us to save costs (Danke, Martina!). This one turned out much better than I’d dared think- let’s hope it’s a sign….